You first meet the protagonist of Night in the Woods, twenty-year-old Mae Borowski, when she arrives at her hometown’s bus station after dropping out of college. She remarks that the bus station is probably the newest and fanciest building in the town of Possum Springs, all the better to give people coming through the best first impression possible. However, we soon see that the bus station, with its shiny floors and glorious sunny mural advertising prosperous life in Possum Springs, is just a façade, and as soon as Mae arrives in the town proper, we see that it’s crumbling inside and out. As Mae explores her childhood home, the game’s use of color, landscape design, character dialogue and atmospheric music all help to build a rich, vivid, sensory picture of this once-great but slowly dying coal town, injecting so much personality that the setting almost feels like a character. Which not only makes it a fantastic backdrop for the unfolding story, but a neat metaphor for what’s going on with Mae herself. And… also a little bit of something deeper and darker. Spoilers for the end of Night in the Woods ahead! Let’s start with the idea of Possum Springs serving a symbolic purpose, to mirror our protagonist Mae. It’s pretty obvious that Mae is one of many young people who has a complicated relationship with the town—the first song she plays with her old high school band belts out the lyrics “I just wanna die anywhere else […] anywhere, just not here”. There’s a lack of jobs and air of desperation hanging over all the residents in Mae’s generation as yet another symptom of the town’s industrial collapse, and you gradually find out that her friends are either depressed to be stuck there or saving up tirelessly so they can move. Mae hasn’t been home for two years, so when she returns she’s forced to reconcile her rose-colored memories of the place with the dull and sometimes harsh reality of how the town is now. The landscape mirrors the characters and their relationships—in Mae’s absence, the mall where she used to hang out with her best friend Bea has devolved into a depressing wasteland due to lack of money and care, just like her relationship with Bea has degraded and fallen apart as they’ve grown up. Mae also finds that her favorite carnival float from the town’s spring festival has been shoved, unloved, into a storeroom, dilapidated and full of rats. She adopts the rats, but you can’t miss her heartbreak over the float being abandoned and forgotten when she loved it so much as a kid. In the same way, you can’t miss her disappointment that the mall is nowhere near as fun as it once was, which matches her disappointment that she and Bea have drifted apart. As Mae wanders through places she used to play, half of which are now tattered, sad-looking, or straight up abandoned, Mae is effectively wandering through the ruins of her childhood. Things just aren’t the same as they were, and the nostalgia factor quickly fades to reveal that everything’s kind of falling apart. The fact that it’s autumn and Mae tends to wake up in the middle of the afternoon every day adds to this, with the whole landscape dyed in tired, sunset tones and covered in dead leaves. Boarded-up windows, proud founder statues with their heads knocked off, and sparse, sad, abandoned lots all add to this detailed sense that the town is at a low point, maybe even dying. The whole place feels creaky and sad and exhausted, a stark contrast to those ever-present murals showing Possum Springs in its heyday. The game developers have even said they were trying to evoke the Gothic genre with this sense of a haunted landscape that’s left behind when industry dries up. So the slow death of Possum Springs mirrors the slow death of Mae’s youth and the creeping awfulness of adult reality in this crummy town. This isn’t the only way Mae’s psyche is tied to the visual landscape, either: Mae soon begins to have strange, psychedelic dreams, all of which take place in some bizarre, warped version of the town’s landscape. The dream sequences are… pretty open for interpretation, and I don’t know if there’s one key thing they “really mean”, but you can certainly read them as a representation of the way Mae sees her childhood home now: topsy-turvy, surreal, and a little frightening. The dreams, and the haunted, Gothic sense of the real town, bundle together to create an off-kilter atmosphere that’s amazingly effective. Night in the Woods has a supernatural element, but the player legitimately can’t be sure of this until almost the very end of the game. Until then, you can’t know if Mae’s dreams are just dreams, or if she really saw a ghost on Halloween; if there’s something genuinely sinister behind the disappearance of her old school friend Casey or if he just left town because, like many other kids there, he couldn’t stand the idea of living his whole life in the crumbling Possum Springs. Even though you don’t officially know there’s something spooky afoot until the end, the sense of it is there right from the beginning, and it’s all in the setting and the way it’s presented. The feeling that the town is alive and dying doesn’t just make for a vivid backdrop and a neat metaphor for Mae’s character, but actually turns out to be foreshadowing. See, there is something about Possum Springs that’s alive. Or at least, there’s a bottomless pit at the end of an abandoned mine shaft, and when you throw people into it, the town is “fed” and seems to gain some of its mojo back. A band of ex-miners have formed a cult around worshiping this force (just referred to as “he”—whether it’s literally The Devil, or some sort of Lovecraftian elder god, or just a personification of the land itself, is never specified) and routinely sacrificing townspeople to it, in order to ensure that plants keep growing, sinkholes don’t open up, and maybe one day the depleted mines will yield again and the town can move into another industrial boom like “the good old days”. This reveal comes as a shock, but not necessarily a surprise, since that sense of something not being quite right has been there since the very start. Even that first opening scene with Mae standing in the brightly-lit bus station, then stepping out of that surreal, fake, liminal space into the moonlit woods, was uneasy. Nothing scary happens on that trip home, but the whole scene gave me goosebumps. This sense of something being off is enhanced by the gradual addition of the dream sequences and the spooky mystery that begins to unfold in the second half of the story, all bundling up towards that final reveal that something under the town is ancient, alive, and very much eating people. Once you get there, that funny feeling you’ve had in your stomach for the whole game finally makes sense. Throughout the whole game, the worldbuilding is effective enough that you come to understand Possum Springs as a rich, layered place with personality and history—and through that, and through her interactions with this place, you come to understand Mae better too. Mae’s town is a vivid, cleverly put together living landscape that is a joy to explore, even if the hidden nooks and crannies you discover and the bonus conversations you have with side characters are often depressing or bittersweet. In the end, Night in the Woods is a story about carrying on in a crappy time, and Mae exemplifies that as much as the town itself does, both of them stuck in a war between the glorified past and the not-so-glorious present. Without spoiling too much, the end message of the game is that clinging to the past and sacrificing teenagers to a possible elder god is not the most healthy of coping mechanisms. As well as being a vivid and interesting interactive setting, and reflecting the game’s protagonist, the way the town and landscape is presented also makes for fantastic atmosphere, with color, lighting, and little details all building together to create a subtle and effective haunted undercurrent to the place. Hell, part of what makes this so effective is the fact that you can’t be sure if this Gothic atmosphere is because of something supernatural and spooky, or just because returning to life in a busted mining town where you don’t know what to do with yourself would be a genuinely unsettling experience. The game’s setting is effective because it’s stylized but also detailed and realistic, representing a very real problem in a fictional space and adding in some cosmic horror, perhaps using that absurd thing to draw attention to the mundane tragedy of Possum Springs’ downfall. Snow begins to fall in the game’s epilogue, crisp white slowly replacing that exhausted, dying orange of autumn afternoon that had colored the rest of the game. You’re not sure if Mae will be okay, or if Possum Springs will be okay, but there’s a definite sense of a new beginning reflected in the landscape and atmosphere. This narrative power in the visual landscape starts in the bus stop and continues to the final moments of Mae’s adventure, and I have to say it makes Night in the Woods one of the most compelling story worlds I’ve visited for a long time. 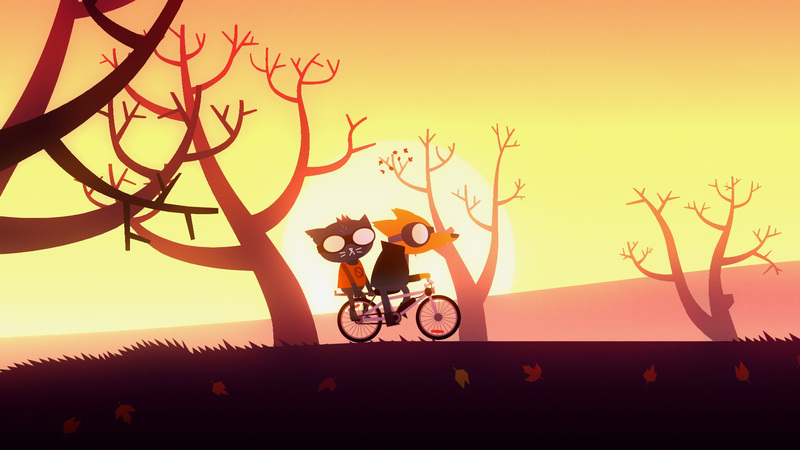 This entry was posted in opinion, Reviews, Video Games and tagged indie games, Mae Borowski, Night in the Woods, NITW, Possum Springs, video game, video games, Worldbuilding by The Afictionado. Bookmark the permalink.